It Was 50 Years Ago Today: 'I Want To Hold Your Hand' Hit U.S. : The Two-Way Listen to a clip. We can almost guarantee it will raise a smile. 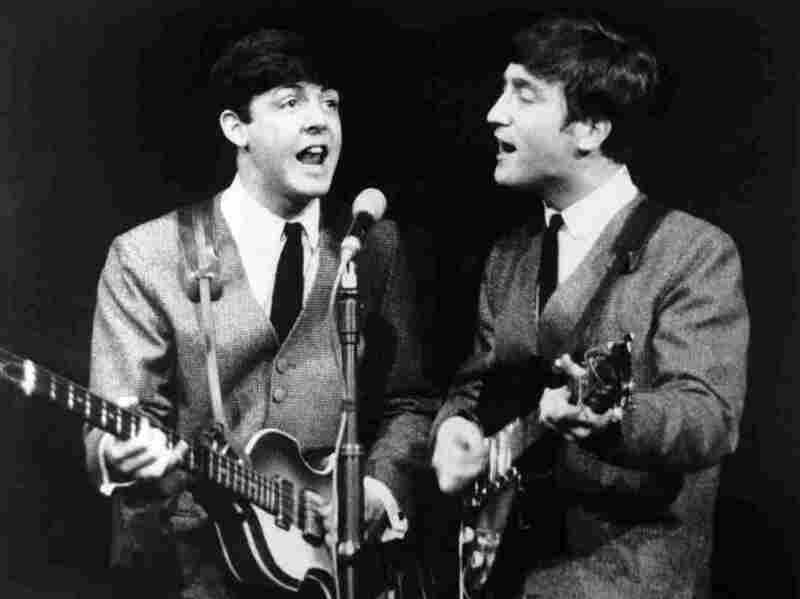 I Want To Hold Your Hand is the song that kicked off Beatlemania in the U.S.
Paul McCartney, left, and John Lennon during a November 1963 Beatles show in London. The next month, the band had its first big hit in the U.S. and Beatlemania started to sweep America. If you don't smile after clicking "play" on the box above ... well, then either we're too old or you're too young. It was 50 years ago today, Kabir Bhatia from member station WKSU in Cleveland reminds our Newscast Desk, that Capitol Records released the Beatles' I Want To Hold Your Hand in the U.S. The fab four, as he says, had "sold millions of records in Europe throughout 1963, but had flopped in the U.S. after several releases on small, regional labels." Then came I Want To Hold Your Hand. Capitol, according to Penn State Beatles authority Kenneth Womack, had planned to release the song in early 1964. But "Carroll James, a Washington, D.C., deejay began playing a U.K. import of I Want to Hold Your Hand on WWDC radio. Faced with unprecedented public demand, Capitol released the single ahead of schedule in late December." This was back in the day, of course, when songs were put on vinyl. By the time the band made its famous first appearance on The Ed Sullivan Show on Feb. 9, 1964, I Want To Hold Your Hand was "in the midst of a seven-week run at No. 1," he adds. More than 2 million copies of the single had been sold in the U.S. and it was still flying off shelves. We hope you enjoy the clip, and perhaps dig out that old single for a fresh listen.